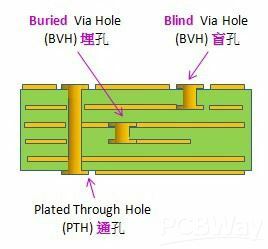 Using blind and buried vias in a PCB design has its advantages and disadvantages. The advantage, of course is that this technology offers a viable design technique to help meet the density constraints of lines and pads on a typical design without increasing the layer count or board size. The disadvantage of the technology is that due to the additional operations in manufacturing the board, the cost of a board using blind and/or buried vias is significantly higher than a typical multilayer_ board with the same number of layers. That said, companies can reduce cost with blind vias if they’re made through peck drilling. Peck drilling plunges the drill into the board multiple times in order to remove material buildup and prevent rough spots.